On April 13, 2010, Davitt McAteer was asked by former WV Governor Joe Manchin, III to form an independent investigation panel to investigate the cause of the Upper Big Branch Mine explosion that took place on April 5th 2010, and to offer recommendations to prevent future explosions. The panel has issued its final report to the Governor, the Governor's Independent Investigation Panel (GIIP). The report can be viewed here, and errata here. On April 5th 2010 at 3:01 PM local time twenty-nine miners died and one was seriously injured with life altering injuries as the enormously powerful blast rocketed through two and one-half miles of underground workings of the Upper Big Branch mine, nearly 1,000 feet beneath the surface. Of the 29 men killed, 19 died as result of carbon monoxide intoxication, and the remaining ten died as a result of injuries suffered in the devastating mine explosion. To date this is the most deadly coal mining disaster in the United States in 40 years. Longwall: A method of extracting coal seams from a long working face. 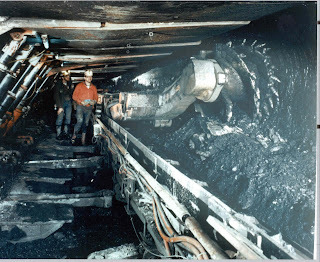 As the workings advance in a continuous line, which may be several hundreds of yards in length, space from which the coal has been removed is either allowed to collapse or is completely or partially filled or stowed with stone and debris. Longwall Shields: At UBB the longwall mining machine had 176 shields, roof shields or supports, each measuring 1.75 meters wide (or about 5.74 feet.) One "pass" on the longwall is a complete trip by the shearer from shield #1 to shield #176; a second "pass" would be the return trip from shield #176 to shield #1. Methane (CH4): Odorless, colorless and highly combustible,is the most common hazardous gas found in underground coal mines. The picture below is one from my personal archives, not one from the report, which has several pictures of evidence and memorials. My picture shows a typical Joy longwall shearing machine. The report gives a minute by minute sequence of events leading up to the disaster, and the agonizing wait of the families for days to find out if their husbands and fathers would ever return home. The final identification of the deceased came when they removed the bodies on April 10, 12 and 13. A family member told the Governor's Independent Investigation Panel that this time was particularly agonizing because each family was holding out hope that their loved one was one of the missing, not one of the dead. At 2:59:38 PM, the crew cut power to the longwall by disconnecting the shearer manual stop button, as logged by the Joy Network Architecture (JNA) control system sold by Joy; a system that I was once imminently familiar with in a past life. This shutdown is standard industry procedure when potentially serious problems occur on a longwall, and it is something that had to be done manually. Also the electrical breaker to the shearer, located at the headgate, was found "knocked," meaning that the power to the shearer had been manually disconnected. The removal of power in this manner can only be done by someone at the headgate. A person must both push in a button and pull a lever. The disconnect has a visible "off" position. The water to the longwall face also was turned off at the headgate, something I personally find odd. Longwall crews do not leave the face area unless it is quitting time or there is an emergency. The longwall face at Upper Big Branch was 1,000 feet wide with 176 shield bases for a miner to step over. Walking through this narrow space and having to duck, and not kill your shins as I can personally attest to, in the low areas means a miner would have to have a good reason to leave the longwall face. Investigation tells us that these men witnessed something ominous and took steps to try to avert a disaster. Regrettably, they were not able to do so. 3:01 - 3:02 PM, Explosion erupts through the mine blasting debris out the portals and lasting for several minutes. The carbon monoxide monitoring system alarms and mine fan records show a major disruption to the ventilation. Governor's Independent Investigation Panel has concluded that the ignition point for the blast was the tail of the longwall. As the shearer cut into the sandstone mine roof, the resulting sparks ignited a pocket of methane, creating a fireball. The fireball in turn ignited the methane that had accumulated in the gob during the Easter weekend and leaked onto the longwall face. The fireball traveled into the tailgate area, where accumulations of coal dust provided fuel for a second, more deadly, force. This dust-fueled blast ricocheted in multiple directions, traveling across the longwall face, into the tailgate entry, and through more than two miles of the mine. The report states that deep water collected - at times neck-deep - (I've personally waded through waist deep water in mines), and tracking systems that did not work, as well has reports of shortcuts taken in safety in the name of profit. The comment on page 65 "band-aid approach" hit me personally. I've been in mines, many of them over the years. I once asked the longwall foreman that I was with why the 4400VAC trailing cable (powers the shearer) had so many band-aid's (several layers deep) on it, "did it get an ouchy or what?" I recall asking. His answer was chilling: "Management thought we were using to much electrical tape, so they refused to give us more. They don't care how many band-aids we use." I also found the cartoon on page sixteen by Nick Anderson from the Houston Chronicle offensive, it has no place in a report that claims to be objective. Steve Fiscor Editor-In-Chief of Coal Age Magazine also feels the report lacks objectivity. Ultimately, 29 miners lost their lives in the Upper Big Branch mine because multiple safety systems failed in a major way, from technology to management to government regulators. Read the report and keep it in mind when you thing of taking a shortcut in safety, or some boss starts pencil whipping you. Do you want a death on your conscious because of a shortcut in the name of production? This week, July 27 2011, Safety Research & Strategies, Inc published two documents taken from the court of Senior Judge William T. Swigert of the Fifth Judicial Circuit in Sumter County, Florida. This 51-page decision, by Judge Swigert excoriated Ford for systematically concealing a long history, stretching back to the 1970s, of studying the problem of electromagnetic interference and unintended acceleration. SRS has an on going page devoted specifically to new Toyota Sudden Unintended Acceleration studies. It is interesting to note that in 2004 Toyota licensed some of its technology to Ford. 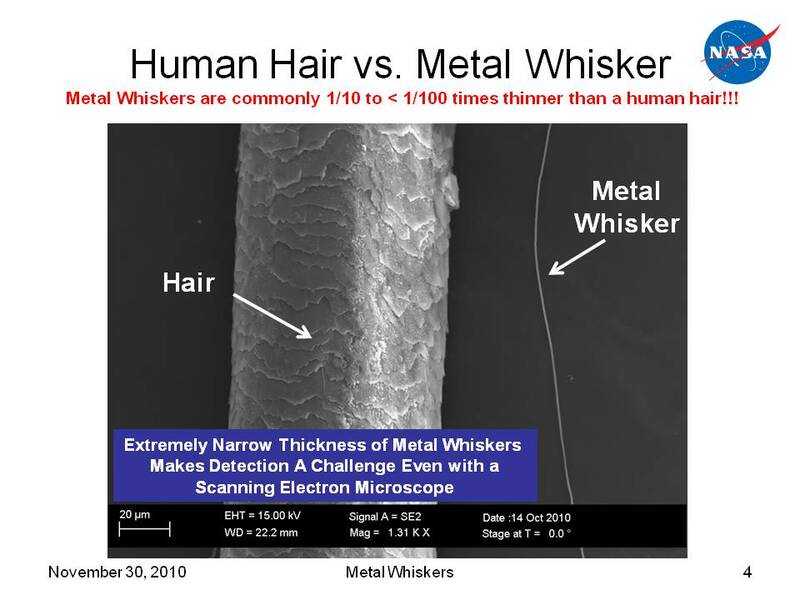 Last week July 21,2011, SRS published How NHTSA and NASA Gamed the Toyota Data , covering issues of Tin Whiskers (see my past blogs Soldering Defect Database: How many ways can a solder joint fail? More than you might think and The Anatomy of a Race Condition: Toyota vs AVR XMega ), 'losing' the data the NASA report was based on, and other dubious practices. What NHTSA's Data Can Tell Us about Unintended Acceleration and Electronic Throttle Control Systems . by R. A. Whitfield of Quality Control Systems Corporation gives a brief analysis of the raw National Highway Traffic Safety Administration (NHTSA) data. In my past blog entry The Anatomy of a Race Condition: Toyota vs AVR XMega on NASA's on Toyota's sudden acceleration problem, I went into some of the details as to what I believe is happening. I explain why the Sudden Acceleration issue would not issue a diagnostic code if the problem is based in the firmware of the engine control unit, which is something I never seen covered in any of these reports. Guess they are all done by people with no experience in designing the systems they are reporting on? Robert Zimmerman, NP4B/VE3RKZ, describes five years of research at McMaster University in " Transmission and Reception of Longitudinally-Polarized Momentum Waves ." James Clerk Maxwell's famous equations [See my note below] of electromagnetic radiation predict an alternative form of radiation, which Zimmerman refers to as vector potential radiation. He was involved in research that results in a demonstration of the communications potential of what was previously considered to be only a theoretical curiosity. In the context of 'Longitudinally' studies, it is important to note that what we find in our text books today are not truly James Clerk Maxwell equations but the corruption of Maxwell's work by Oliver Heaviside. Maxwell's true equations are in the form of Quaternions. Quaternions are a relative of complex numbers often used to parametrize rotations in three dimensional space. In modern computer work they are frequently used to rotate objects without build up of round off error, as you can rotate a quaternion faster than you can rotate a matrix. Quaternions (and their kin) are described in far more details in this document (with errata and addenda), from the Boost Math Library. Maxwell's 20 Quaternion Equations may be found here at Rex Research ('Rex' can always use some support, help him out and buy something there). The importance of 'Potential' was dropped by Heaviside because Heaviside did not understand the math. What I'm truly perplexed by is Robert Zimmerman apparent belief that what he is calling Longitudinally-Polarized Momentum Waves is a new discovery. Robert implies that his work is new, and the publication of something that you can really build and experiment with following his construction article is new. Perhaps it is due to the different terminology used over the years? Roberts article describes how to send 'Momentum Waves' and receive them using a six inch "U" shaped plasma tube that you can pick up at most hardware stores, with in depth construction tips. Abstract: "Extension of abnormal glow discharge detection of electromagnetic radiation to visible wavelengths is observed with inexpensive commercial indicator lamps. The spectral response and mechanisms of detection are discussed and advantages over gas-filled photo-diodes noted. Responses from different discharge regions are observed and their implications considered." General Electric Glow Lamp Manual 2nd Edition see graph on page one and description on page two. 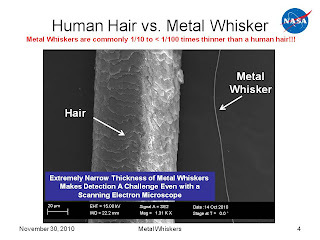 Around 2007 I was communicating with Dr Ted Anderson about his new "Plasma antennas [that] can magically vanish; New antennas made from plasma, rather than metal, have advantages of being stealthy, reconfigurable, and resistant to jamming". [Note that Plasma antennas may be nested, will get back to the geometry later.] Dr. Ted's group was putting together a web site and had big plans for this new antenna, especially in light of its military applications. Such an antenna can only be detected when running, and due to its high bandwidth it does not have to be running long to communicate data using spread spectrum techniques. A standard metal based antenna can be detected and targeted by an enemy with the proper equipment. Dr. Ted said "I am preparing a package for you on the plasma antenna. I will be sending it soon. Please give me a couple of days. Perhaps we can work together." then dropped off the face of the earth, as did his web site. Jumping back in history again we find the work of James Harris Rogers (Again curtsy of Rex Research, whom needs support), from 1919, whom I've mentioned before. Rogers work was used in World War One to communicate with submarines. Hams of the day also experimented with Rogers antennas when they were published in Electrical Experimenter magazine. Tom Bearden once made the comment that Rogers' work had been rediscovered at least five times then quickly "lost", it worked to well apparently. Was Dr. Ted "lost"? Hopefully with Robert's publication in a well respected magazine in the Ham Radio experimenter field this work will not get "lost" again. Towards A New Electromagnetics Part I: Solution to Tesla's secrets and the soviet Tesla weapons. Toward a new electromagnetics Part III: Clarifying the vector concept. Towards a new electromagnetics part IV: Vectors and mechanisms clarified. I'd not waste time on later works, as explained here, nor most of what you find on Internet. You need to find the original books from the 70's and early 80's. Rogers work is known by a few other names and related research such as the Aharanov-Bohm Effect (Physics), Poynting Vector (Mathematics), Scalar Waves (Pseudoscience). The differences comes down to issues of geometry but I've not got my head wrapped around all of that yet. 4,429,280, 31 Jan 1984, Apparatus and Method for Demodulation of a Modulated Curl-Free Magnetic Vector Potential. 4,429,288, 31 Jan 1984, Apparatus and Method for Modulation of a Curl-Free Magnetic Vector Potential Field. 4,432,098, 14 Feb 1984, Apparatus and Method for Transfer of Information by Means of a Curl-Free Magnetic Vector Potential Field. 4,447,779, 8 May 1984, Apparatus and Method for Determination of a Receiving Device Utilizing a Curl-Free Magnetic Vector Potential Field. 4,605,897, 12 Aug 1986, Apparatus and Method for Distance Determination Between a Receiving Device and a Transmitting Device Utilizing a Curl-Free Magnetic Vector Potential Field. 4,491,795, 1 Jan 1985, Josephson Junction Interferometer Device for Detection of Curl-Free Magnetic Vector Potential Fields. There is also 5,845,220: Communication method and apparatus with signals comprising scalar and vector potentials without electromagnetic fields , H. Puthoff. The Aharanov-Bohm Effect is most relevant to Robert's work above: Significance of Electromagnetic Potentials in in the Quantum Theory by Y. Aharonov and D. Bohm in The Physical Review, vol. 115, no. 3, Aug. 1959. Abstract: In this paper, we discuss some interesting properties of the electromagnetic potentials in the quantum domain. We shall show that, contrary to the conclusions of classical mechanics, there exists effects of potentials oncharged particles, even in the region where all the fields (and therefore the forces on the particles) vanish. We shall then discuss possible experiments to test these conclusions; and, finally, we shall suggest further possible developments in the interpretation of the potentials. and Quantum Interference and the Aharonov-Bohm Effect " Yoseph Imry and Richard A. Webb in Scientific American, vol. 260, no. 4, Apr. 1989. Abstract: Can electrons be influenced by a nearby magnet so well shielded that its force field cannot be detected? The counter intuitive answer is yes: an energy emanation from the magnet known as the potential does indeed affect the electrons' wave function. This quantum-mechanical effect is being brought to bear on the development of new microelectronic devices. Once we know the other names, we find a detector by Robert Shannon [I know that particular detector was destroyed in a fire. There is one remaining housing to build a new one if I ever make the time]. Bob lists several Translation Modes to exchange between electromagnetic waves and 'potentials': Magnetostatic Detectors, Electrostatic Detectors, and Plasma (NE2 bulbs are easy to play with). T. E. Bearden, "Virtual State Engineering and its Implications," NTIS ADA065762, 1978. Abstract: Experimental evidence of zero-point energy of vacuum has been established beyond question. Soviet direct measurement of this energy has been reported. Prigogine's Nobel Prize work confirms that in theory a highly disordered, chaotic, virtual state, zero-point energy can be cohered to crosstalk into observable quantum change and even macroscopic energy production. Several simple devices can be demonstrated to observably tap zero-point energy. Extension of the theory onto even a simplified hyperspace model indicates direct applications in certain specialized amplifiers. Consideration of multiple simultaneous observation (Everett's interpretation of quantum mechanics) ties together virtual and observable states into the same time change, allowing super position of virtual state into observable state. By considering virtual state patterns to be carried by the individual photon, then superposition effects can be obtained upon a target radiated by a radar beam if each and every photon of the radar beam contains one virtual state pattern in common, added into its other (incoherent) virtual state patterns. Sufficient superposition of the coherent pattern in the target produces real observable changes which may have significant applications. Such applications include electron current dissolution (dudding of electro-magnetic circuits), cancellation of electromagnetic fields, de-activation(dudding) of nuclear warheads by transmutation of fissionable materials, and simple production of particle beams of enormous power density. Electron current dissolution is also effective against the nervous systems of biological targets. It thus appears that electromagnetic radiators such as radars could possibly be made into universal, all-purpose weapons effective against every major battle element. A mechanism and a theory for direct amplification of the virtual state into observable state is given. At least one known device, Moray's free-energy apparatus, successfully applied virtual state engineering to produce 55 kilowatts of power from a 55-pound device by tapping zero-point energy.